As you may have noticed the trunk lighting appears rather dim. Actually the lighting is not all that bad, but since everything is black, it’s hard to see the lights are actually on. I’d rate the existing lighting at least average or somewhat above average for car trunk lighting, but most car’s trunk lights are rather dim, if they even have lights. You can also mix methods, as first two methods offer better color rendition, the third method uses a better connectorization method for getting power. You can even merage parts of different methods to suit your needs and abilities. If this project are beyond your advanced DIY efforts, a simpler project is to replace the Tesla LED units with brighter ones. While not nearly as illuminating as our projects above, they do offer improvement. You can order a set of brighter LED replacement units from Amazon and other sources. While we show detailed instructions for the Model S (all versions), with minor modifications, the techniques apply to the Model X. 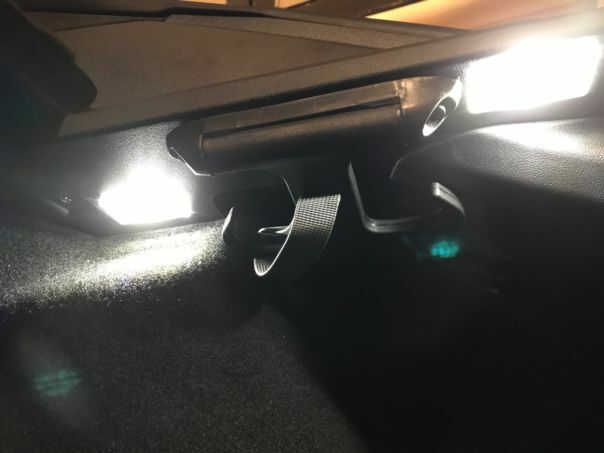 See our Trunk lighting project for the Model 3. This shows the difference at night between standard Tesla lights and lights mounted under the parcel shelf brackets. Thanks for the video – I’m sure it will be helpful. The other unused connector is likely the wires for the Subwoofer and rear hatch speakers that are on the Ultra High Fidelity Sound system. I have a 2015 85D with no trunk lighting as described by @elijah. Thanks to your video, @elijah, I was able to easily find the 2 pin 12 volt power connector on the passenger side by pulling the sidewall carpeting away in the right rear corner of the trunk space. I looked for a power connector on the driver’s side as well, but did not find one. I decided to make 2 segments of LED lights with 8 foot long 20g connector wire to place on either side, under the lip of the trunk cover as depicted in this post. I was able to run the connecting wire for the LED strip from the driver’s side over to the power connector by going behind the carpeting and then behind the plastic housing that spans the rear portion of the trunk and then behind the carpeting on the right side to the connector. The bottom edge of the housing was easily lifted and unclipped to allow enough space to run the wire, and then easily clipped back into position. On the passenger side, I tucked the wire into the area behind the side wall carpeting. I made the connector wires the same length and connected in parallel so the lights would be the same brightness. One could also attach them in series, and run a connector wire from the end of one LED strip to the beginning of the other, but that seemed like more hassle. If you do connect in series, just make sure the + and – are correctly adhered to. Thanks for this helpful post. My 2015 MS (just a few weeks old) has the tech package with power lift gate, fog and cornering lights and the lights under the doors and handles, but no lights in the trunk – just cutouts in the carpet where they should be. I’ve tried to find the LED connectors under the carpet, but have not had any luck. 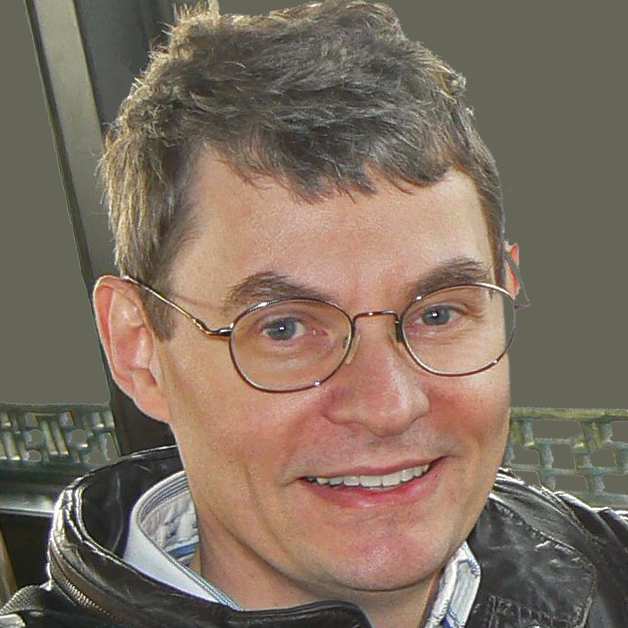 @ Akikiki – you said you found the wires on the left side. Could you confirm that you’re referring to the driver’s side? I’m hesitant to pull up the carpet any further for fear of damaging something – does anyone have more detailed instructions or photos for how to safely do this? Tesla has undergone many wire harness changes, but we suspect the wires for the lights are just behind the cutouts when not equipped with these trunk LED lights. In some cases Tesla tapes unused connectors to the wire bundle, so it my not be obvious at first. I’ve not pulled back the entire carpet, but generally nothing is glued, but held either with plastic snaps or velcro. Perhaps someone else has pulled the carpet out from the back corners and can give you some more advice. Good luck! I have no connection to this merchant, just appreciate a fellow MS owner, who is willing to help. My MS does not have the LED lights on either side of the inside of the trunk. I am working on adding lighting to the trunk. After acquiring some parts and reading the how-to’s on TeslaTap.com and TMC, I thought I was ready. But my MS does not have the basic LED lights that it seems others do. So, I called my local SC and asked it there was a service bulletin or announcement that explained this. A few minutes later, I got a call back. Once upon a time, the trunk lights and interior lights were part of the Tech Package, but were separated. The lights were expanded and became the Premium Interior Lighting option. There’s a cutout for the LED lights in the corners, but not punched out yet. Since the lights are now an add-on as an option it could be that the harness is there and ready for the lights. Will not know until we open it up and check. We will report on this later when we know more. Actually for the first 12 months of production, the side trunk lights were standard (no tech package). Hopefully the wires are still available behind the cutouts. Let us know what you find out. 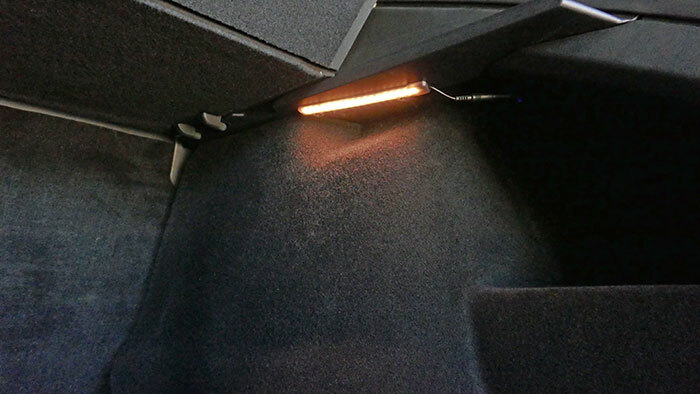 Even on cars without the side trunk lights,the connector for the LED Light is there behind the cutout imprint. The imprint of the cutout itself has a small cut already in it. You can make it a little bigger with a box cutter. Don’t cut too wide, you don’t want to completely open this as you want a part left to fill the hole since you don’t have the LED light. I fished my finger around inside the cutout, but could not find a wire. So, I took my well cover out, removed the plastic carpet tacks that hold the carpet in place on the opening to the feet well. Then wrestled the carpet arms on the outside of the well, up and out of the way. I was surprised I could pull the carpet up high enough to expose the pad in the center of the trunk (not that I was trying to get to the pad). Once the foot well carpet arm was up and out of the way, I could see and more easily pull the LED light connector down and out. There was only about an inch of play. So, I opted to cut the cutout imprint a little and fished around for the connector and pulled it up and through the cutout. Now, I had about three inches of play and like the picture above, I could attach quick-connect patch wires to give me some working room. Then I pushed the LED connector and the quick-connected patched wires back through the cutout. Now I have a power source for the LED strips. I added barrel connector w/wire like shown above to my power extension wires and my LED strip. Left side I tucked extra wire up around the inside plastic frame of the trunk until I got to the plastic of the parcel shelf rail. With wire tucked in, I pulled the tape and mounted the LED strip. Right side. I could not locate the LED light connector. So I tucked two new wires about 4 feet long under the plastic lip just inside the trunk across from the left side to the right side. Once on this side I used the same barrel connectors w/wire like above instructions. Now connected the other LED strip and tucked the extra wire along the plastic of the trunk up to the right side parcel shelf rail like the left. Confident everything is connected, I opened the back door to trigger the lights, and bingo works. My strips could be brighter. (It is what it is.) I can easily though add two more LED strips along the curve of the inside of the trunk with ease. I may do that yet. The best part of this is the new LED lights are on the same circuit, and controlled by the same timer that the lid’s single light is. This saves us the effort of a separate switch, mounting it, and remembering to turn it off every time. Backing up a little, at first I was not sure this was a LED light connector. So, I put black plastic tape on two small safety pins and stuck one in each side of the front of the connector. Then using an ohmmeter tested for power. At first it seems dead. Then I checked that the hatchback lid’s light was off. So, I opened the back door to trigger the light. It did. Now the connector had power for a few minutes until it timed out. Next I temporarily wire an LED strip to the safety pins and tried again. This time the opened door triggered the LED strip. Perfect, now I know the quick-connector is in fact the LED Light connector even though the LED light is not present on my car. I just took possession of a MS, no premium lighting. I see the cut-outs on either side, and I can pull the liner out where it meets the back of the seats and peer down the wheel well, but have not disassembled further. The driver side has a large bundle of wires with two small connectors looped back and taped down. Are those possibly the light connectors? Neither are long enough to reach the cut-outs, but I can’t think of any other function. Others have said the wires are in place for the rear lights, even if you don’t have the lights actually installed. While you can buy the lights from Tesla and connect them up, they are quite dim, especially with all the black carpeting. You might find someone that has the bottom lights installed and see if it’s worth getting them. Otherwise, I’d recommend our lighting project to get some real brightness in the trunk area. Where did you have the tan carpet made up?